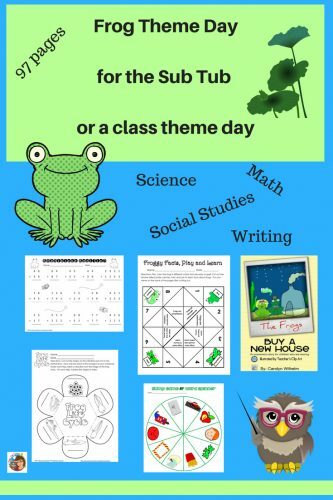 Frog theme day plans can be an ace in the hole for that time when a substitute is needed on an emergency basis. 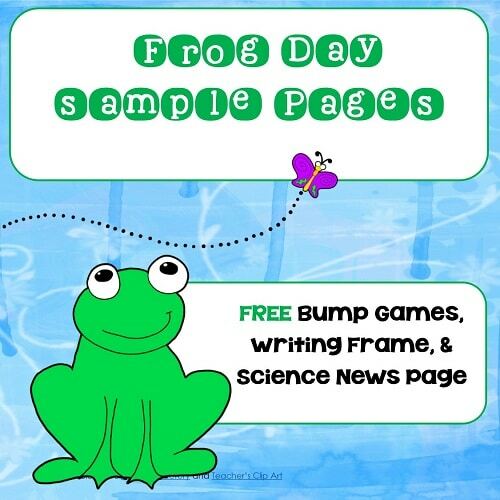 Be ready with a full day of print and go activities and place in a tub for a sub in the event you ever need to just call and simply tell the substitute where the materials are located. Of course, a seating chart, maybe name tags, a copy of class procedures, and the class schedule should also be printed. Those kinds of items may already be in the substitute folder, maybe even in the office. This is a 97 page PDF with literacy, writing, math science, and social studies. 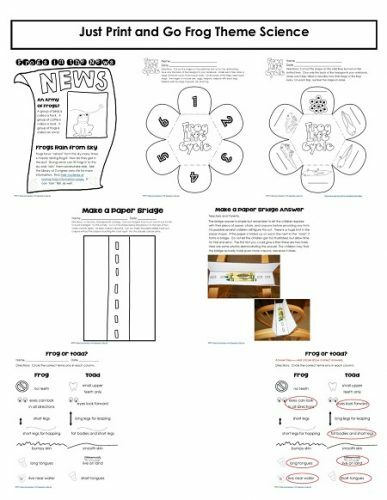 There are options in the math and writing pages to help provide differentiation. The teacher would indicate which students should work on which pages. It is available in our premium Amember area on the science page. *See other resources in our premium Amember area here. 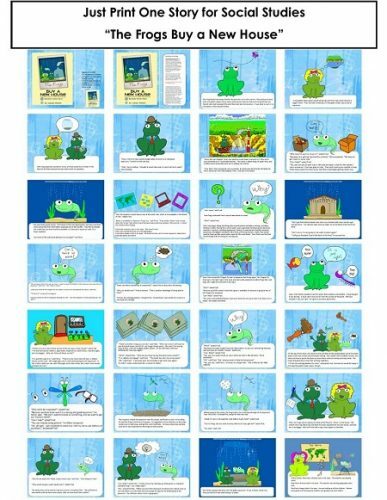 For reading, there is a readers’ theater play with 14 student parts. The scripts would need to be printed and stapled. Perhaps the cast name tags would also be printed as an option. Have two students practice each part so that at the first reading half the class has a turn to perform, and then the rest at the second reading. 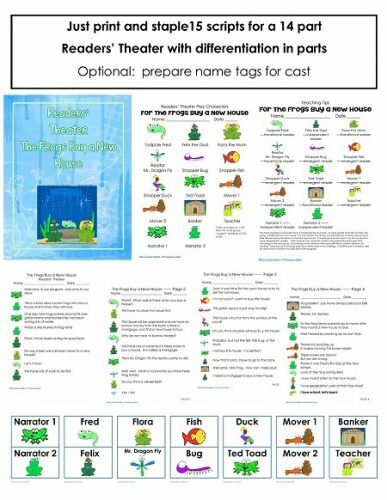 Have you heard the frogs are moving from the fishbowl all the way to the pond? A growing family needs more room. This economic and social studies story matches the reading play. 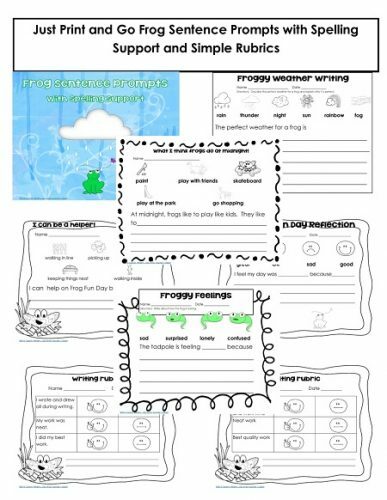 Two writing sets of prompts are provided. One set has more support with illustrated words for emergent writers. There are student and teacher rubrics. Another set of writing prompts is for more independent writers. 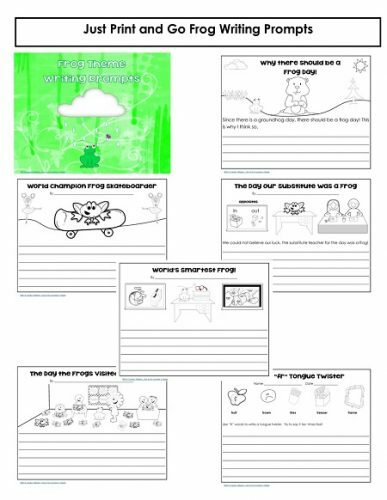 The lifecycle of the frog is presented through an interactive student notebook activity. There is also a bridge building activity using only a single piece of paper and a few crayons for weight. 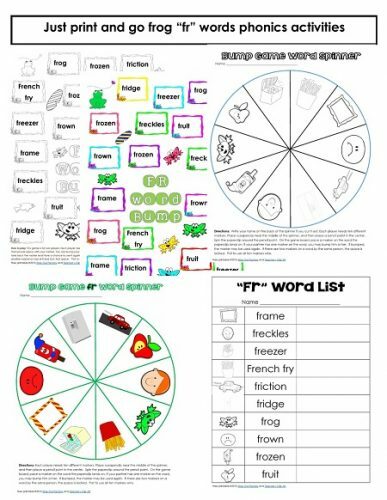 There are phonics bump games for the “fr” sound. 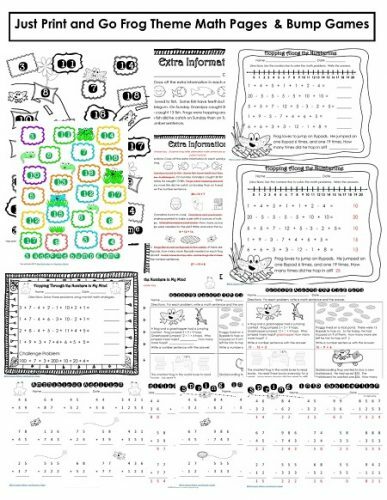 The math pages include some bump games for 3-addends as well as worksheets at different levels. Download a free sample pack at this blog post link. 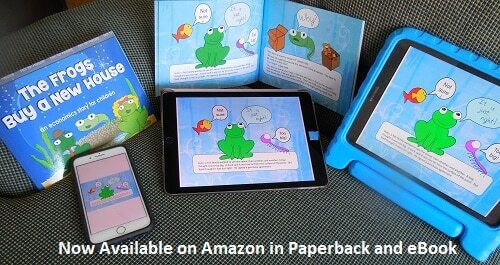 You might also like the paperback or eBook version of The Frogs Buy a New House: An Economics Story for Children. It is available on Amazon.